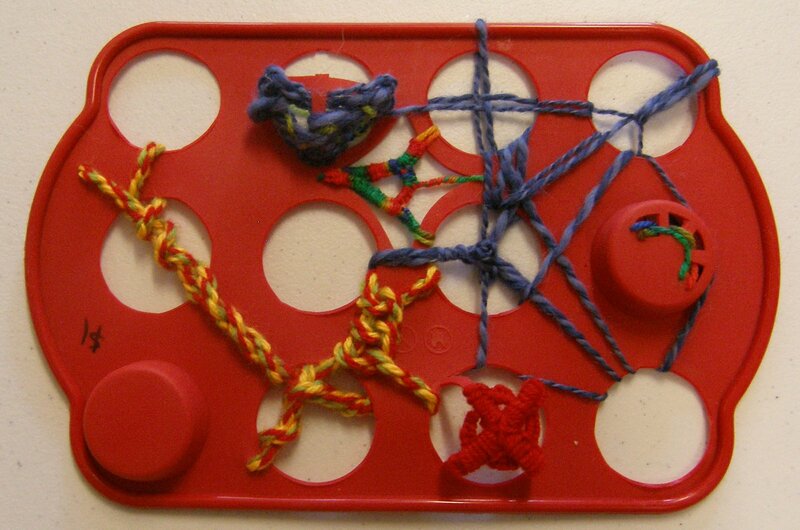 Another weaving exercise, this time using a rigid grid and working within that. For my first sample I made a grid of bamboo skewers, securing them with thread. I wove strips of fabric and net between the skewers. 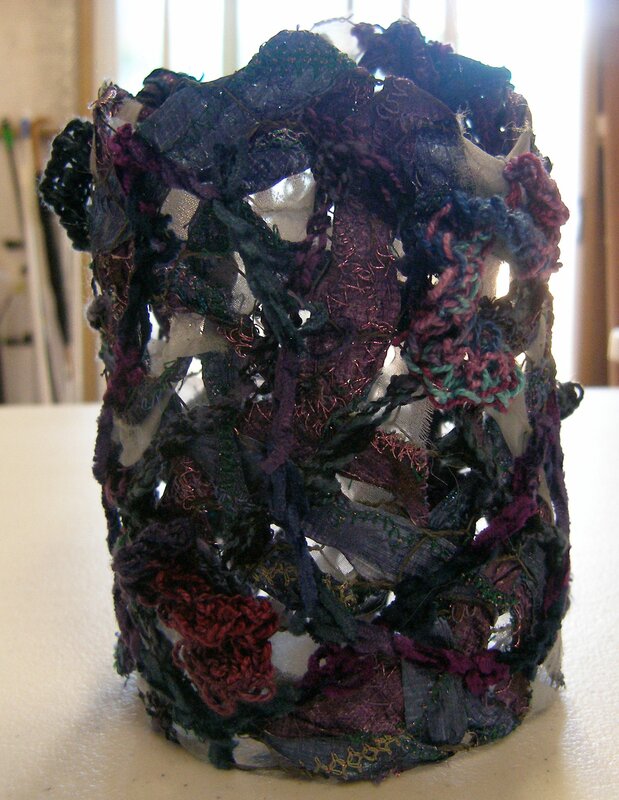 This produced a very textured piece with a good contrast between the wooden skewers and the fabric. My next sample was very experimental! I bought a flexible muffin tray from the op shop (second hand shop) and cut out some of the wells completely, and cut into some of the other wells to leave some parts still in place. I picked bright wools to tie in with the strong primary red. I made a cord with some of the wools, used others as single threads and worked buttonhole stitches with others. This piece is very three dimensional because of the sections of the tray that I left uncut. For my last sample I used a chicken wire grid. I painted and stitched some Tyvek and cut this into strips to weave through the grid. Once woven through, I used an iron to shrink the Tyvek in places. Then I wove through some white chiffon to provide contrasting colour and texture. After this stage I joined the ends to form a cylinder. I liked the result at this stage but felt the piece was too flat and would benefit from a change in materials and some extra dimension. 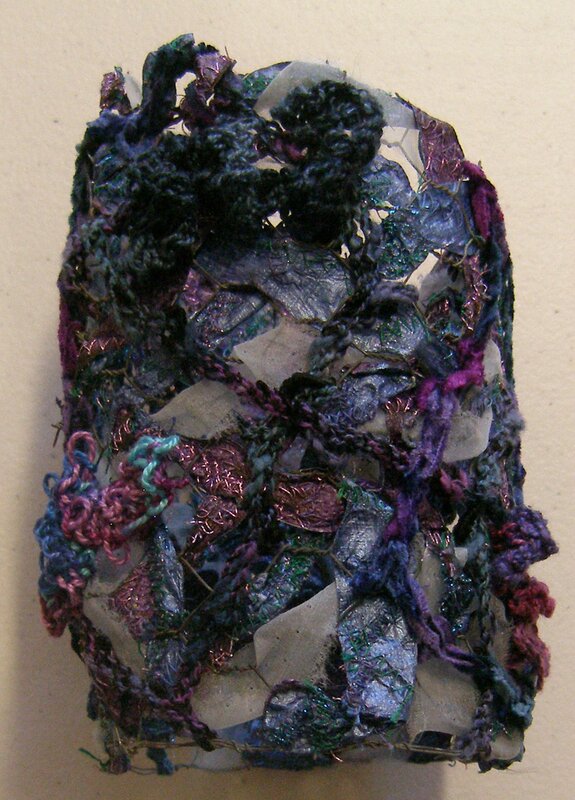 I added surface crochet chain stitch in variegated wools and then knitted on some ruffles; both of these techniques were ones I picked up on my Freeform Knitting and Crochet workshop in April. I was pleased with the result after this extra embellishment as it enhanced the colours and made the surface much more interesting.